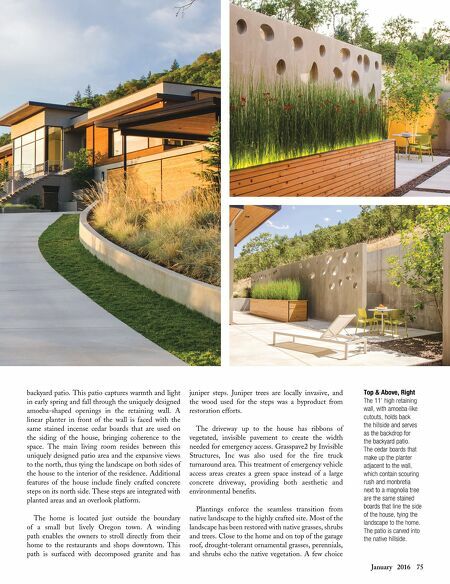 74 Landscape Architect and Specifier News Sustainable design and contemporary architecture are perfectly fused together in this stunning hillside house and landscape in Oregon. The project achieved the U.S. Green Building Council's highest ranking, LEED for Homes Platinum certification. The home was designed to be 60 percent more energy efficient than a typical home of comparable size, and displays a modern atmosphere. 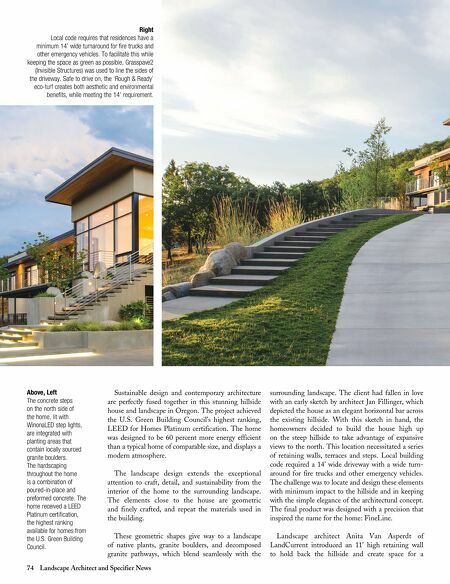 The landscape design extends the exceptional attention to craft, detail, and sustainability from the interior of the home to the surrounding landscape. The elements close to the house are geometric and finely crafted, and repeat the materials used in the building. These geometric shapes give way to a landscape of native plants, granite boulders, and decomposed granite pathways, which blend seamlessly with the surrounding landscape. The client had fallen in love with an early sketch by architect Jan Fillinger, which depicted the house as an elegant horizontal bar across the existing hillside. With this sketch in hand, the homeowners decided to build the house high up on the steep hillside to take advantage of expansive views to the north. This location necessitated a series of retaining walls, terraces and steps. Local building code required a 14' wide driveway with a wide turn- around for fire trucks and other emergency vehicles. The challenge was to locate and design these elements with minimum impact to the hillside and in keeping with the simple elegance of the architectural concept. The final product was designed with a precision that inspired the name for the home: FineLine. Landscape architect Anita Van Asperdt of LandCurrent introduced an 11' high retaining wall to hold back the hillside and create space for a Above, Left The concrete steps on the north side of the home, lit with WinonaLED step lights, are integrated with planting areas that contain locally sourced granite boulders. The hardscaping throughout the home is a combination of poured-in-place and preformed concrete. The home received a LEED Platinum certification, the highest ranking available for homes from the U.S. Green Building Council. Right Local code requires that residences have a minimum 14' wide turnaround for fire trucks and other emergency vehicles. To facilitate this while keeping the space as green as possible, Grasspave2 (Invisible Structures) was used to line the sides of the driveway. Safe to drive on, the 'Rough & Ready' eco-turf creates both aesthetic and environmental benefits, while meeting the 14' requirement.